Hardly Housewives: "36 Hours In..."
When I'm booking a trip, one of the first things I do is look at the New York Times website and see if there's a "36 Hours In..." whatever city I'm heading to. Some are a bit outdated, but oh my goodness, they have such great ideas and insight into visiting a city. I know I'll find some off-the-beaten-path adventures and reliably delicious food. In our most recent travels, while in Poland we had "36 Hours in Krakow" in hand and hit up most of their suggestions. We happened to stroll past The Cupcake Corner on our way back to our B&B and stopped in for a much-needed break from walking the city. 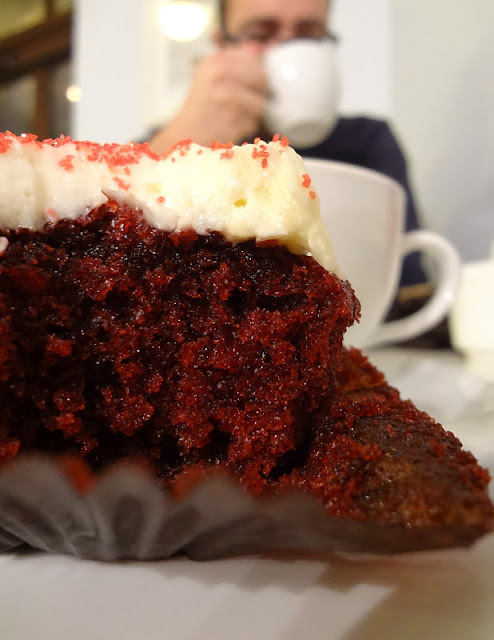 As suggested, I ordered a red velvet cupcake and, as usual, they didn't steer me wrong. Yum. Reading the "36 Hours In..." weekly is like a mini-vacation... revisiting places I've been already (Trinidad, Bar Harbor, Phuket) and drooling over places I'm dying to go (Cape Town, especially, and Marseille and Honolulu). What do you use to help plan your trips? TripAdvisor? Lonely Planet? Might I suggest picking up this weekend's copy of the Times? Stay hungry, my friends, and stay adventurous! I love that idea...that way you aren't just wandering around missing the best stuff!